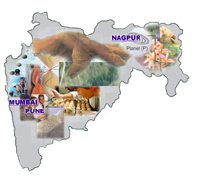 (A) Contributing to sustenance, planning and coordination of science and technology in the State. (B) Concerning itself with the improvement and modernization of science education in schools, colleges, universities and technical institutions of the state. (ii) Balanced agricultural and industrial development, consistent with the environmental and socio-economic objectives of the State. (D) Concerning itself with the role of science and technology in the service of the rural community. (I) Cooperate with the Government of Maharashtra, and make available to the Government, the results of its studies and expert investigations, as well as undertake special studies on behalf of the State Government when called upon to do so. (II) Cooperate with industries in the State in attempts to solve technological problems facing them. (IV) To promote research projects and studies on scientific and technological problems of special relevance to the State. (V) Cooperate with other learned bodies in and outside the State for the promotion, utilization and popularization of science. (VI) Promote and maintain liaison between science, humanities and letters. (VII) Undertake publications of research papers, reports, journals, monographs and books and other audiovisual aids in various fields of science and technologies. (VIII) Organize meetings, seminars and conferences. (IX) Secure and manage funds and endowments for the promotion of science and technology. (X) Undertake and execute all other acts which will assist and promote the usefulness, aims and purposes of the Academy. All donations to the academy are exempted from taxes.